CAROM BILLIARDS, sometimes called carambole billiards or simply carambole (and in some cases used as a synonym for the game of straight rail from which many carom games derive), is the overarching title of a family of billiards games generally played on cloth-covered, 1.5-by-3.0-metre (5 by 10 ft) pocketless tables, which often feature heated slate beds. 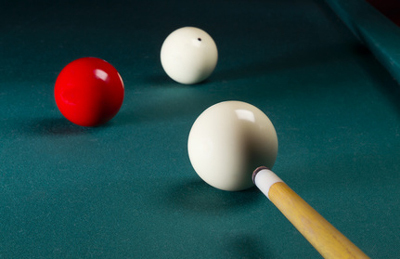 In its simplest form, the object of the game is to score points or "counts" by caroming one's own cue ball off both the opponent's cue ball and the object ball(s) on a single shot. The invention as well as the exact date of origin of carom billiards is somewhat obscure but is thought to be traceable to 18th-century France. Alfredo de Oro - (1863-1948). Cuban professional carom billiards and pool player who several times held the world title in both three-cushion billiards and straight pool simultaneously. DOUGLAS PELL - sterling silver chalk holder. GEORGE BALABUSHKA - "the Stradivarius of cuemakers". Lemonade stroke - an intentionally amateurish stroke to disguise one's ability to play. MOZART AND BILLIARDS - a billiard table with five balls and 12 cues was among Mozart's estate when he died in 1791. RAYMOND CEULEMANS - (1937-). Legendary carambole player. Sandbagging - in billiards and other games, deliberately playing below one's actual ability in order to fool opponents into accepting higher stakes bets, or to lower one's competitive rating in order to play in a future event with a higher handicap and consequently have a better chance to win; the term has spread to chess, go and other such games. Also known as hustling. UNION MONDIALE DE BILLARD - world tournament sanctioning body. ASKA BILLIARDS - pool billiard cue sticks and cases. Famous brands: McDermott, Viking, Falcon, Mezz, Joss, Schon, Lucasi, Players, Aska, Pechauer, Predator. Balabushka pool cues - Billiard Warehouse. 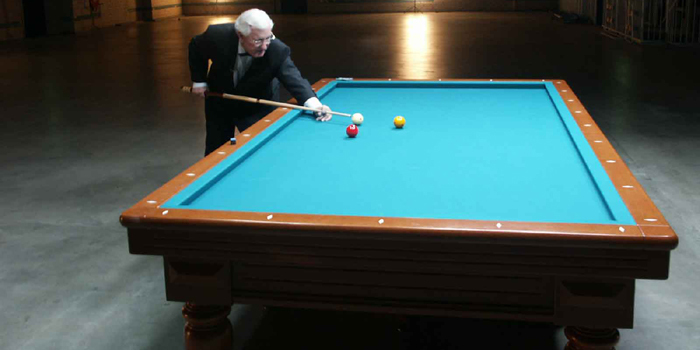 BRUNSWICK BILLIARDS - billiards tables and accessories since 1845. Budget Billiards - "Name Brand Pool Cues at Budget Prices!" The #1 Meucci Retailer Worldwide. LONGONI CAROM CUES - made in Italy since 1945. POOLDAWG - pool cues, billiards, pool cue cases. VIKING POOL CUES - "Handcrafting cues since 1965."